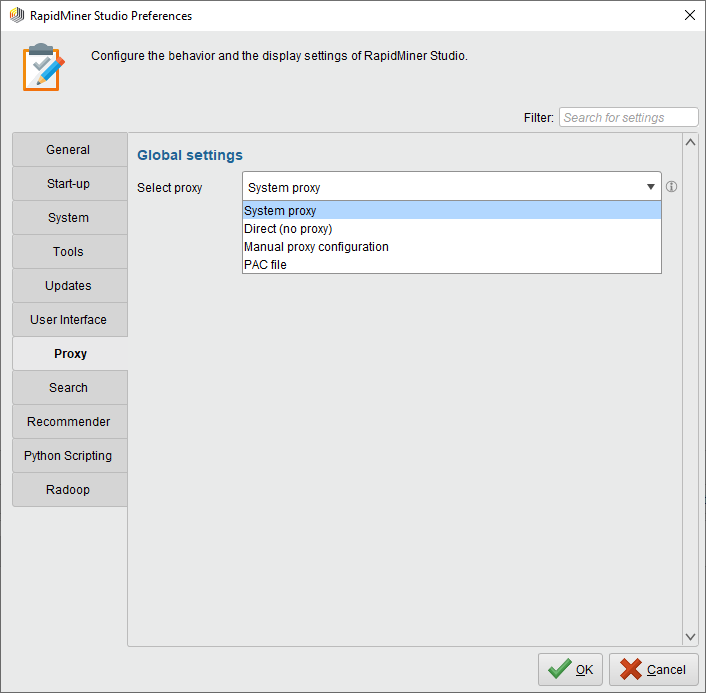 The proxy settings of RapidMiner Studio are located in the Proxy tab of the Preferences dialog. You can choose between using your system proxy configuration, no proxy at all or to provide a manual configuration. By default, RapidMiner Studio is using the proxy configuration of the operating system. Changes to the Windows proxy settings are detected automatically; other operating systems require a restart of RapidMiner Studio for changes to take effect. Web Proxy Autodiscovery (WPAD) and Proxy Auto Config (PAC) are not supported. Please provide a manual proxy configuration instead. The direct mode is used to ignore your system and manual proxy configuration. Transparent proxies applied by your Internet service provider or company cannot be bypassed. This mode allows you to provide custom proxy settings for RapidMiner Studio. When this option is enabled on Windows and Linux platforms and no matching manual configuration is found then RapidMiner Studio will default to the system proxy settings. A list of hostnames and ip addresses that should not be proxied. These rules are only applied on proxies that are defined in the manual proxy configuration. Proxies that are only configured in the operating system are only using the rules applied in the operating system. The rule localhost|127. *|[::1]|0.0.0.0|[::0] contains different notations of the loopback address. The list is seperated by the pipe |, while the star * is used as a wildcard. You could also exclude your local RapidMiner Server repository or database connection from using a proxy. The SOCKS proxy configuration is used for socket connections and as a fall back if no protocol-specific proxy is defined. Generic Security Services Application Programming Interface (GSSAPI) is not supported. These are protocol-specific proxies, which are only used for connections the respective protocol. In the event that the configured proxy requires authentication, you will be prompted to enter authentication credentials when a connection is attempted. Valid credentials are temporarily stored for the duration of the session whereas you will need to click the "Remember password" checkbox for permanent storage. 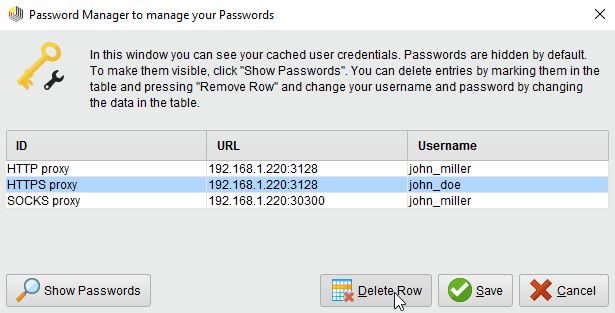 In case credentials become invalid or outdated, please open the Manage Passwords dialog in RapidMiner Studio by going to Settings > Manage Passwords, delete the corresponding entry, press save and restart RapidMiner Studio.